The book’s initial section highlights the importance of culture within an investment firm – the characteristics of strong cultures, the imperatives of communication and support, and suggestions for leading firms through times of both adversity and prosperity. It continues with a thorough discussion of active portfolio management for equities. The ongoing debate over active versus passive management is reviewed in detail, drawing on both financial theory and real-world investing results. The book also contrasts traditional methods of portfolio management, based on accounting metrics and price-earnings ratios, with Epoch Investment Partners’ philosophy of investing on free cash flow and appropriate capital allocation. 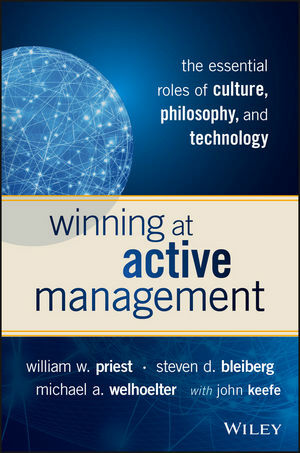 Winning at Active Management closes with an inquiry into the crucial and growing role of technology in investing. The authors assert that the most effective portfolio strategies result from neither pure fundamental nor quantitative methods, but instead from thoughtful combinations of analyst and portfolio manager experience and skill with the speed and breadth of quantitative analysis. The authors illustrate the point with an example of an innovative Epoch equity strategy based on economic logic and judgment, but enabled by information technology. Winning at Active Management also offers important insights into selecting active managers – the market cycle factors that have held back many managers’ performance in recent years, and the difficulty of identifying those firms that truly possess investment skill. Drawing on behavioral economic theory and empirical research, the book makes a convincing case that many active investment managers can and do generate returns superior to those of the broad market. WILLIAM W. PRIEST is Chief Executive Officer, Co-Chief Investment Officer, and a co-founder of Epoch Investment Partners, and a long-time advocate of free cash flow investing. His other books include Free Cash Flow and Shareholder Yield and The Financial Reality of Pension Funding Under ERISA. STEVEN D. BLEIBERG is a Managing Director and Global Portfolio Manager at Epoch Investment Partners. MICHAEL A. WELHOELTER is a Managing Director, Portfolio Manager, and Head of QuantitativeResearch and Risk Management at Epoch Investment Partners.